I am restoring a Wagemaker Wolverine and would like a step by step plan. 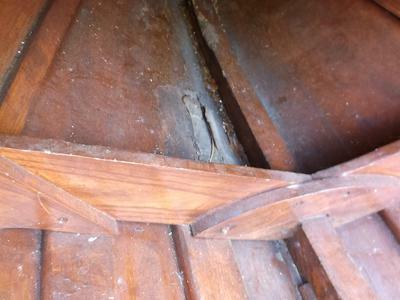 There is some dry rot on the hull under the front seat. What products do I need to prep this before varnishing. 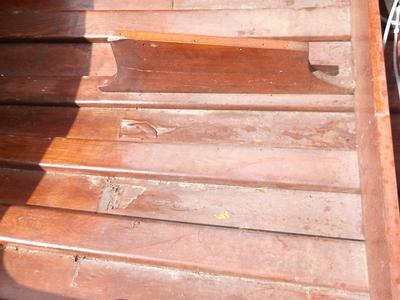 Is it actual rot or just where the varnish has blistered allowing the top layer of plywood to become damp? The gap between the frame and the floor may have been blocked at some time, trapping water there. Always hard to tell from a photo but it looks as though it may just need to be allowed to dry out then perhaps soaking with penetrating epoxy before varnishing. The top of the grey area looks to be more of less the waterline. Since the damaged sections will not be seen I would like to try liquid epoxy. 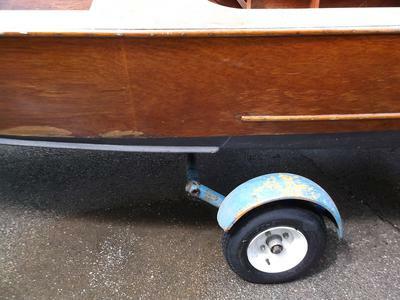 Could I simply treat the area with spore killer, seal it, sand it, and apply varnish? What are the brand names of these products and where can I buy them. I would not like to cut anything if I don't have to. Also, where would the paint line be on the outside hull? You need to drill a few holes to prevent standing water. You can take a chisel and dig it out, put a patch in, if you do it with glue and are good at it you will not see it. If not do your best, cut two matching shapes, glue and epoxy cold cure works but you still have the dark wood. I would cut it out with a router and build a jig. 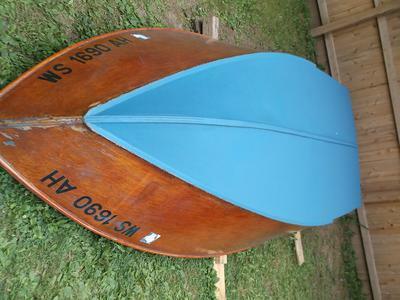 The flake under the seat is just sand and new varnish. Good luck, nice boat looks well made. The bottom painting is done, so next is the side touch-up. Is it possible to match the stain, sand, and varnish this small area. Or should I just strip the sides? Also would I gain any speed by clear coating the bottom to a smoother finish? I doubt if gloss/matt on her bottom would make any difference to her speed. As for the sides stripping will get you the best results. Check out the answers previously given to a similar question about Geoff's Peterborough Nomad here.